Majlis, the Iranian parliament, on Sunday formally began consideration of the nuclear agreement with major world powers after the much-anticipated report by its Special Commission on JCPOA, entitled “Islamic Republic Government’s Reciprocal and Proportional Action in Implementing the Agreement,” was presented to the full house. The 20-page report is heavily critical of many aspects of the Joint Comprehensive Plan of Action (JCPOA), including provisions related to defense, sanctions relief and the future of enrichment activities. The Majlis will now send the report probably back to the same commission to produce a bill for consideration. 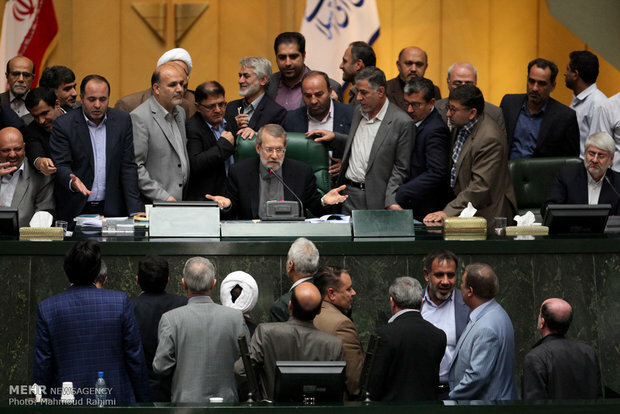 The bill coming out of the commission could propose a yes or no vote on JCPOA by the full Majlis. Or alternatively the Majlis could send today's report drafted by the special commission, with all its criticism of major components of the nuclear agreement, or a revised version of it, to the country's Supreme National Security Council (SNSC) for final consideration, effectively passing the responsibility for approving the JCPOA at its present form to SNSC and Rouhani's government. Picture explains a thousand words.What classy "members of parliament" we have in Iran.